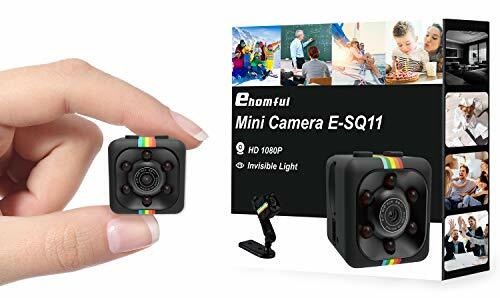 Ehomful Mini Spy Camera, Wireless Hidden Secret Night Vision Camera,1080P Nanny Camera for Security Surveillance. Very small at 0.9 inch. 1080p clear image @ 30fps. Fast switch on power and mode button. Clear logic on led indicator. Access to recording while charging. 24/7 hour recording with extra power cord or power equipment. Motion Activated for 1 minute video recording that movement or activity is detected. What Our Mini Spy Camera Wireless can Do for You? Portable Mini Video Camera: Take a record when you are having class or meeting. Wearable Body Camera: Take with it on you body to have fun with some activities outside. Pet Mini Camera: If you have ever wondered what happens when you leave the pets alone. Nanny Cam: Wonder how baby sister look after your child. Secret Spy Camera: Whether your office is secure when you are not around. Hidden Spy Camera:Someone vandalize your property. Storage: Micro SD card, maximum extended memory 32GB. 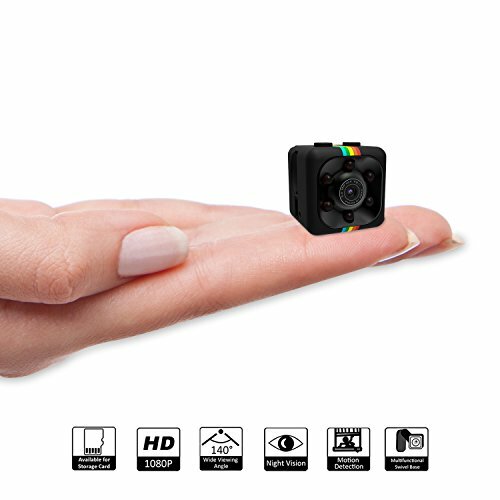 Mini Hidden Camera-- Smallest spy camera in the world at 0.9 inch.It is great ideal for spy gadgets.Plastic with metal finish, you will feel one tough tiny spy camera in your hand. 6 infrared led lights around small mini camera lens and one brightness sensor for night vision. Innovative swivel bracket with small hidden video camera allows you to monitor in any angle.Use as wireless security camera or plugged in as small nanny cameras,you have both choices for either. Best Mini Spy Camera Wireless Make Amazing Happens-- 1 second to boot and your hidden surveillance camera is ready to go! Fast switch on Mode button to set up 720P/1080P,motion detection and photo.1 second to set up alligator clip to attach any part of body or equipment. The Hidden spy video camera is designed with extreme clear logic,which could assure you never miss where you are.Live streaming records with 140°wide angle lens to provide wider field of vision and reduce blind spots. Night Vision Spy Camera --Wireless security camera is enhanced with integrated infrared lights turning on at night to shed light on the smallest wonders.IR led lights will be activated when the light come to the dark.A black and white live streaming video mode will be played on small hidden camera. 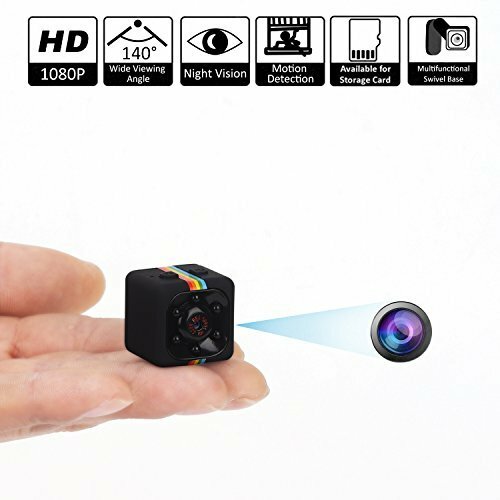 You will get a high-contrast and considerable clear video in the dark with exceptional range.We provide this high quality mini camera to ensure your security purpose in our endeavor. 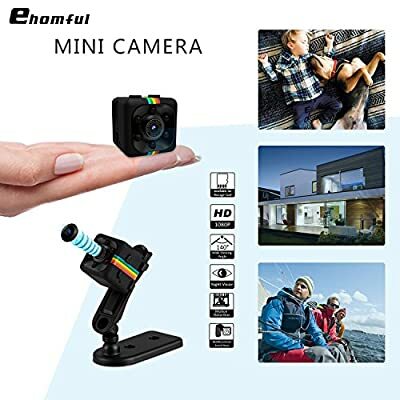 Small Mini Camera Motion Activated--Cam recorder provide a 24/7 live streaming video with extra power.This mini security camera is with highly sensitive and wide-angle sensor for motion detection. Hidden Spy camera will make sure all triggered activities or movements in your notice.A short video will be proceeded to record.You will have a quick access to check what's happening in details.All motion video clips will be recorded on an external Micro SD card with no extra cost incurred. 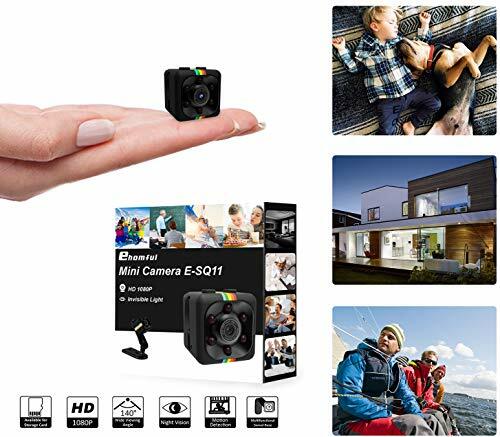 Utilize Small Hidden Video Recorder Creatively--Cam recorder is small,light and very portable .Micro camera is preferable to set up security, warehouse,bedroom,lobby and offices etc. Secret spy camera provide you a access to have a look at your pet when you leave it at home. Also it's awesome make it as a nanny cam for your children.With loop recording function the mini camera for home can automatically tape over old footage. All video clips are stored in Micro SD card.